Populations of all Arctic marine mammal species compared here1 are currently at relatively high levels of abundance (with one exception2) — or presumed to be so (some are technically “data deficient” due to lack of quality survey data). Both the US and the IUCN consider some species (but not others) to be threatened or vulnerable to extinction based on future sea ice losses that might occur due to predicted effects of global warming. The US has the most complex system of conservation designation, with two federal agencies offering different opinions (Fish & Wildlife Service (FWS), for the Endangered Species Act (ESA); NOAA, for the Marine Mammal Protection Act). Footnote 1: For simplicity, I have not included cetaceans in this analysis, since beluga and narwhal generally represent a small component of the diet of animals hunted by polar bears (although they may be locally or seasonally important). Carcasses of large whales are feed upon by polar bears but they are not actively hunted. Footnote 2: The hooded seal is considered ‘vulnerable’ by the IUCN due to actual population declines (85-90 % over the last 40-60 years) in the Northeast Atlantic that are so far unexplained. Populations in the Northwest Atlantic, however, are stable or increasing. In contrast, polar bears are considered ‘vulnerable’ by the IUCN due to future threats predicted to occur due to global warming. A review of this status category by June 2015, under strict new rules, has been ordered by the IUCN, to be prepared by the IUCN Polar Bear Specialist Group. 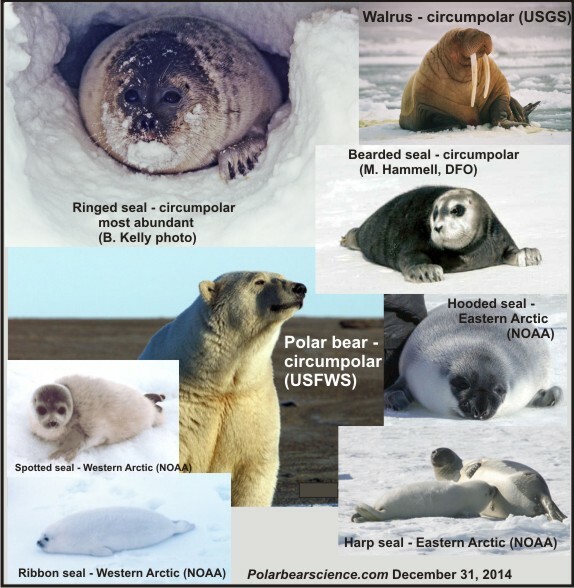 This entry was posted in Conservation Status, Summary and tagged AGW, Arctic nations, arctic seals, bearded seal, conservation, global warming, IUCN, North Pole, polar bear, Polar Bear Specialist Group, ringed seal, threatened with extinction, walrus. Bookmark the permalink.